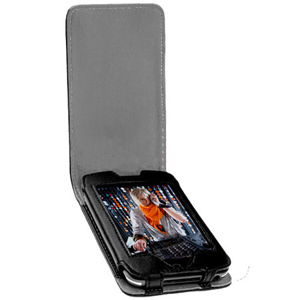 The Krusell Music case is a simple, stylish leather case for both the first and second generation iPod Touch. To use it you just slide your phone in and then choose to attach a belt clip or carry it around. The case is compatible with the full range of multidapt mounting accessories, so no matter how or where you want to mount your iPod touch, you should find a clip to suit. The case is made from high quality leather and has a soft suede finish lining that helps to keep your screen free of fingerprints and smudges. The headphone and dock connector are easily accessible, and the volume controls can be used by pressing the leather on the side of the case which may makes this case better suited to the first generation iPod touch, 2nd generation iPod touch owners may prefer the Krusell Orbit Flex.